The sweltering hot winds from the Sahara desert made sticky with sea-salt sweep through the wide, luxurious avenues of Rabat, once known as “the Pearl of Morocco”. And it is still a very attractive city, albeit a modern one, with ATM machines, McDonalds and other western chain stores springing up almost daily. Rabat’s inhabitants are as attractive and sophisticated as the city itself, and they know it. Anyone foolish enough to be outside in the midday sun will find themselves jostling for a space on the shady side of the street with Rabat’s well-to-do classes, as they stroll self-assuredly to work. 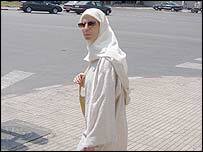 It is not unusual in Rabat to see a Moroccan man wearing an American baseball cap and shorts, while his wife accompanies him wearing a traditional gown or “djellaba”, with the hood up. Morocco is rife with contradictions. 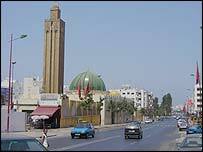 In Rabat the smell of expensive aftershave is carried on the warm breeze, but when the wind blows in Sale, you may even catch a whiff of hashish. Sale, separated from Rabat only by a narrow river, is the poor cousin of the thriving capital, and much more indicative of the state of many towns in Morocco. It is from suburbs like Sale, with high unemployment and low development, that Casablanca’s suicide bombers came from. They were dissatisfied young men, with nothing to do, watching as Morocco’s middle classes opt in to western consumerism. 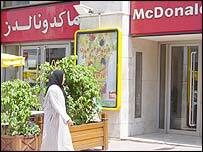 Places like this are a breeding ground for Muslim fundamentalism, which has taken root here over the last 30 years. The Moroccan authorities are actively cracking down on anyone seen as too radical a follower of Islam. And while an Islamic party did better in recent elections than ever before, the king did not appoint any of its members into his cabinet. The official line is that fundamentalism is an imported phenomenon, brought over by hotheads from Saudi Arabia. But many Moroccans I have spoken to say privately that they feel something is going wrong. “We have parroted the ways of the West, dressing like Westerners, worshipping money like Westerners, but without getting any of the development that goes with it,” one woman told me. And many Moroccans identify with what they see as the suffering of their Palestinian brothers at the hands of Israel and America. Morocco may be part of Africa – and sometimes uncomfortably close to Europe – but it is also part of the Arab story. And now it would seem it is stuck between a rock and hard place.